One of my favorite things about the Jabra Stealth was how easy it was to use. Everything worked right away, after the initial Bluetooth pairing of course. To accomplish the aforementioned task, you hold the answer/end call button for three seconds and it starts looking for Bluetooth devices. Find it on your phone and you’re good to go. The other way is to turn on your NFC compatible device, move it to the bottom corner of the Jabra Stealth, then connect it to your device. Simple, right? I was slightly disappointed to find out that the Google Now button on the Jabra Stealth only allowed me to make phone calls. I was hoping for full Google Now integration, such as searching the web, sending messages, or launching apps. Alas, that was not the case. Moving on from my slight disappointment, the Jabra Stealth did perform brilliantly when placing calls using the Google Now button. After pressing the button, you are instantly greeted by the familiar Google Now voice asking you to say the name of your contact that you wish to call or the number. The voice recognition worked great and I never had to repeat myself to get Google Now to understand what I was attempting to say. After you choose your contact, Google Now will ask you to confirm by saying “okay”, after which the call will be placed. 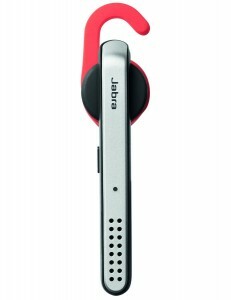 The only other button on the Jabra Stealth is the answer/end call button, which is built seamlessly into the device. This button allows you to answer and reject calls, or end them when you are finished with your current conversation. Pressing the button twice in quick succession also allows you to redial your last call. This is one of the areas where the Jabra Stealth really impresses. The battery life on the Jabra Stealth is one of the best that I have seen on a Bluetooth headset to date. This is all the more astonishing since the Jabra Stealth weighs in at only 0.28 oz. Jabra attributes the small profile and large battery life to its microPOWER battery technology. Jabra states that the battery life will last six hours and after my week with the Jabra Stealth, I can attest the statement to be true. I easily made it 6 hours and that was with me calling everyone I knew to test out the Jabra Stealth. I am sure a more conservative user will be able to squeeze at least an extra half hour or so out of the battery. I took the Jabra Stealth through my daily routine around the office, running track and downtown. This gave me the perfect opportunity to provide a range of situations and the Jabra Stealth came out on top every time. From bellowing winds, chatty co-workers, too noisy city dwellers, not once did I have to repeat myself or ask that of the person on the other line. My sister actually commented on the clarity of my voice and inquired if I had bought a new phone. On my side, all of my calls sounded crystal clear as well. I usually find myself asking the other person to repeat themselves from time to time, and I was surprised after my review period that I did not once have to make that request once. The Jabra Stealth really outdid itself where it really matters, and that is voice clarity. The Jabra Stealth comes with a fear earpieces and hooks that are built for complete comfort. One of my main issues when using a Bluetooth headset is the fact that most of them are not very comfortable. The ones that are, unfortunately, end up sacrificing a snug fit for that comfort. The Jabra Stealth creates a perfect combination that can be best described as comfortably snug. The Jabra Stealth fit into my ear right out of the box and did not once threaten to leave my ear as I took it for a test drive on my morning run. As I finished my run, I was caught off guard when I received a phone call, as I had forgotten that I was wearing the Jabra Stealth. The Jabra Stealth is definitely one of my favorite Bluetooth headsets that I have been able to test due to its lightweight nature, the clarity of the sound and most of all, the comfort that I experienced while using it.